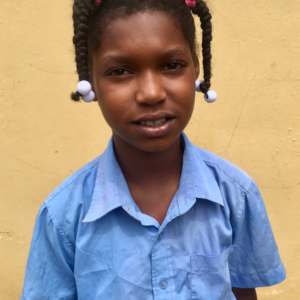 Arianny Marte Ciprian is 9 years old and in the Fourth Grade at the public school in La Represa. She lives with her parents, grandmother, brother, three sisters, and a dog. While Arianny is at school, both of her parents work in the capital two hours away. Outside of school, she likes to play baseball, play with dolls, and swim in the river. When Arianny grows up, she wants to be an English teacher.